Diabetes | Infonet Biovision Home. Diabetes is a condition that affects the way the body uses food. Diabetes can be a very serious and debilitating disease if not well managed, yet a fulfilling and long life can be lived also be realized if you pay attention to your diet and exercise. Our body is made up of trillions of cells specialized to form our different organs, bones, muscles and other body parts. These cells however need fuel for energy in order to function properly. The fuel is obtained from sugar and this sugar comes from the food we eat. The food we eat is converted to sugar, supplying the body with needed fuel. The sugar is then absorbed into the bloodstream, providing us with energy. After we eat, the food settles in our stomachs. Most of this food is broken down into sugar and passed into the blood stream. The sugar is then taken to the cells where it is used as energy. But the sugar cannot be used for energy production without the help of a hormonal regulator known as insulin. Insulin is produced in the pancreas, an organ behind the stomach. When absorbed nutrients pass into the blood, the pancreas sends insulin to the cells of the body. Insulin attaches itself to little doors on the cells called receptors. Here it carries sugar inside the cell to be used for energy. In this way, insulin regulates blood sugar by taking the sugar out of the blood and carrying it into the cells. If you do not have any insulin or (if your insulin does not work right) sugar cannot be absorbed into the cells and so accumulates in the blood. We all have some sugar in our blood. But when there is too much we suffer from the condition known as Diabetes. This kind of diabetes occurs when the section of the pancreas that produces insulin stops working. The result is either a deficiency or lack of insulin. Sugar cannot be transported to the cells and instead accumulates in the blood. Type I diabetes is more common in children and young adults and the onset is usually sudden. This type of diabetes has some genetic connection but there is growing evidence that links child onset diabetes to allergy to bovine serum albumin (BSA) in dairy products. Type I diabetes starts with the immune system destroying the cells in the pancreas that produces insulin. Why this happens has long been a mystery, but newer evidence suggests that genetically susceptible children who have been breast fed for at least 7 months, had a much lower incidence of Diabetes than children weaned earlier. Children exposed to cows milk before 4 months of age also had a higher incidence of diabetes than children not so exposed. Recommendations now are to keep children off dairy products for at least the first 6 months of their lives. Lactating mothers should also avoid cow milk for the same period as BSA can pass from the mother to the child through breast milk. Indications are that 1 in every 4 children are genetically prone to Type I diabetes. (Holford 2007). Avoiding milk may also have benefits for your child's mental development. A majority of autistic children and many hyperactive children are allergic to milk. Type II diabetes is highly preventable yet more and more young people seem to get it. This is the most common form of diabetes, accounting for about 90% of cases. In this case, the pancreas produces insulin, but the insulin does not perform its required function. This can happen when you become overweight. Fat causes some of the receptors (doors) to disappear. The insulin cannot attach itself to the cells to carry the sugar inside. This blockage of insulin movement into the cell is known as insulin resistance. The sugar builds up in the blood (high blood sugar). If you are overweight or even obese you chances of getting diabetes increases up to 77 times normal. Diabetics are also at risk of having high Homocysteine - which is also linked to incidence of Alzheimer's disease, heart attacks and strokes. By following a homocysteing lowering diet and taking suitable supplements you will be able to reduce your chance of getting diabetes or if you are diabetic - to help keep the condition under control and reduce complications. How to treat type I diabetes? How to treat type II diabetes? Weight loss and regular exercise help unblock, the receptors (doors) on the cells. The insulin can then attach itself to the receptors (doors) and allow for movement of sugars into the cell. This then lowers the blood sugar. In some cases, insulin shots or oral diabetes medication may still be necessary to help control type II diabetes. Based on Diabetes Complications Control Trials (DCCT). 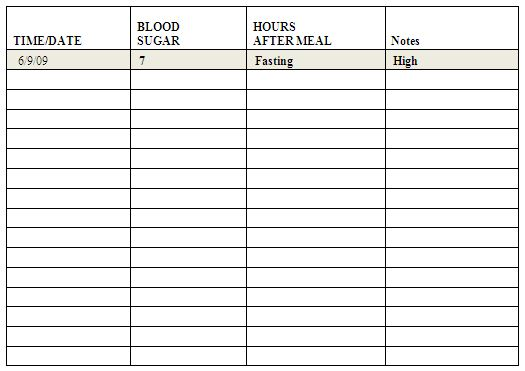 Please use this chart to monitor your blood sugar. You can use the blood sugar recording table to record your blood sugar and make notes on the glucose levels. Are your blood glucose levels are high? If your blood sugar level exceeds the higher limit by the relevant unit, indicate appropriately. Always keep in mind that these are guidelines to help you control your blood sugar. Keeping good records will also help you identify which foods may raise your blood glucose level. If you have not been checked for diabetes, please do. You could be diabetic and not know. It is important to check monthly. 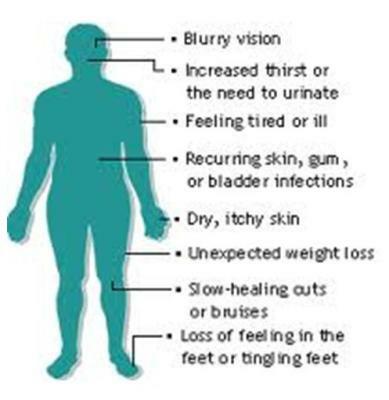 When blood sugar is high it causes complications such as blindness, heart diseases, kidney diseases, sexual impotence and amputation of lower limbs. 1. Eat well-balanced meals (vegetables, starches & protein). Good nutrition simply means eating a wide variety of foods. Don't avoid starches because they provide the body's energy requirements, but go for unrefined fibre rich starches where possible. 2. Control your portion sizes. This is important for your blood sugar control. The more you eat, the higher your blood sugar. Half of your plate should consist of vegetables, with small portions of protein and starch. Do not eat single large meals. Eat three and two snacks a day if possible. Eat less as the day progresses. 3. For those who indulge in alcohol and have no desire to stop, restrict yourself to one glass of wine, a 300 ml bottle of beer or a tot of brandy or whisky, three times a week. You must take alcohol with food. Taking it on an empty stomach causes low blood sugar. Too much alcohol increases your chances of getting diabetic complications. Stub out those cigarettes for good. 4. Take an antioxidant supplement once a day. This is usually a combination of vitamins prescribed by a professional. 5. Regular exercise helps reduce blood sugar and improve glucose control. Walking for 45 minutes three to five times a week is an easily achievable and adequate form of exercise. 6. Regularly monitor your blood sugars. All diabetics must see dieticians and diabetic educators. Knowledge is power. Make sure you go for annual medical check-ups. As mentioned above, some benefits of exercising are: increased glucose uptake leading to a lower blood glucose levels after exercise and increased insulin receptor sensitivity. Regular blood glucose monitoring should be part of your daily exercise routine in order to help you deal effectively with hypo's (low levels) and hyper's (high levels). Before exercise, a snack should be taken in order to prevent a hypo during the session. If the duration of the exercise is is longer than one hour, take a carbohydrate "drink" half way into the session. If you do not have a snack available, a packet (15-25 gm) of lightly salted crisps will suffice. You will not necessarily need a pre-exercise snack, but you must have a drink in order to maintain good hydration during and after the exercise session. Check for ketones in your urine. If positive, do not exercise for at least two hours, and then recheck. If still positive, do not exercise. If you are insulin deficient and you exercise, you will exacerbate the problem and end up with even higher blood glucose level which subsequently makes the ketonic problem worse and could be potentially dangerous. If urine is ketone-free, begin with light exercises and drink only water during and after exercise. As a result of exercise, the insulin receptors are sensitized. This means that they work more efficiently and allow for a better glucose intake after exercise. These receptors remain sensitized for up to 72 hours after exercise, hence the post- exercise hypo's. Furthermore, the liver and body muscles begin replenishing their stores of glycogen immediately after exercise and this process requires an additional uptake of glucose from the blood. Post-exercise hypo's can appear anything from two to twelve hours after exercising up to and including the next day! This may require adjusting your insulin injections. Prior to an exercise session, decrease insulin dosage by approximately 25 per cent. This will give you greater flexibility. Finally, always inject into the non-exercising part of your body, preferably your stomach. Remember these are merely guidelines, and you ultimately have to decide what works best for you. 1. Draft by Infonet March 2011. Holford, Patrich 2007: New Optimum Nutrition Bible. Piatkus books. An imprint of Little, Brown book group, 100 Victoria Embankment, London EC4Y ODY. ISBN No: 978-0-7499-2552-9 Sometimes available in Kenya through Health food shops. Nelms M., Sucher K., Long S.; Nutrition Therapy and Pathophysiology; International Student Edition. Kenya Diabetes Study Group; The National diabetes Guideline; 2nd Edition, Nairobi Kenya.